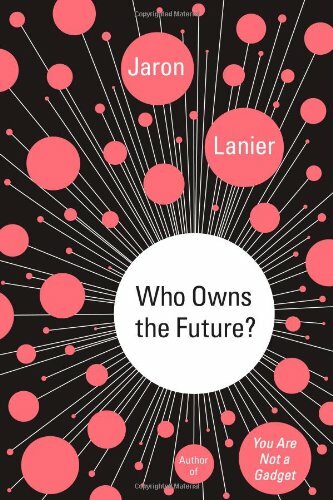 a book review by Robert Schaefer: Who Owns the Future? Who Owns the Future? offers Jaron Lanier’s vision of technology, economics, and politics. His views are so filled with incoherence, muddled thinking, and non-sequiturs that this book was quite difficult to review. Mr. Lanier’s form of expression seldom strays from stream of consciousness, and his rambling occasionally results in unacknowledged self-contradiction. For the future of technology, Mr. Lanier predicts 3D printers will eliminate scarcity, automated vehicles will eliminate drivers, online courses will eliminate schools, and nanobots will eliminate doctors. For a technologist, Lanier is surprisingly out of touch with current technology. In invoking Moore’s law (the observation that the number of transistors on integrated circuits doubles approximately every two years) he makes non-technologist’s mistakes. First he does not recognize that Moore’s law does not apply to software development; and second, he does not recognize that Moore’s law has reached its limit, hitting the triple-wall of power-density, clock rate, and line width. Mr. Lanier, who does at least admit he is not an economist, also appears to be out of touch with pragmatism. In his belief that that information “wanting to be free” is destructive to society he proposes a thoroughly unworkable alternative— micropayments for information—all information. To this end he claims that universal micropayments for intellectual property will simultaneously lift the poor out of poverty and save the middle class. He provides exactly one scenario for micropayments. By taking a photograph with a smart camera, smart software will trigger micropayments to everyone photographed. A more detailed explanation of how this would be carried out is sadly lacking. He does go on for hundreds of pages attempting to explain and justify micropayments but never really gets past hand waving and bloviation. Mr. Lanier also indulges in conspiracy theory. “Siren Servers” by his definition are large computer databases owned by elites, filled with data collected from the masses, and where secret analysis is performed for the purpose of social manipulation. Mr. Lanier’s claim is that the primary purpose of big data is no longer commerce but soft blackmail. Mr. Lanier’s list of Siren Servers includes Google, Wikipedia, Craigslist, Facebook, and Walmart—though he admits that as he once consulted for Walmart, Walmart appears to be a force for good. He also frees the Siren Server’s elites from blame for their manipulation. We the consumers are to blame because we’ve insisted information should be free. It’s not all bad. The section on computer visionary Ted Nelson appears to have taken Mr. Lanier time and effort at least for a few pages to write in a reader-friendly fashion. This reviewer holds the suspicion this particular section was published elsewhere and that some iron-willed editor held in check Mr. Lanier’s natural incoherence. And the section on Ted Nelson is followed by another, just as good. The reader learns Xerox Parc’s technological innovations (the mouse, windows, and the local area net) were kept secret from their corporate masters in the belief that innovation that could obsolete the copier would be, in no uncertain terms, a liability for a copier company. The trouble with these two sections are they are but brief islands of good writing surrounded by hundreds of pages of stormy chaos and incoherence. And at least one idea of Mr. Lanier’s that should have been followed through was just tossed away. His recognition of our increasing dependence on software mediation deserves a studied exploration of potential on consequences, though perhaps it would be preferable if anyone other than Jaron Lanier did the writing. Who Owns the Future? is non-linear, hyperactive, non-sequitur filled, maddening to read, and ultimately unsatisfying. As bad nonfiction books go, Who Owns the Future? is on par with Sam Harris’ The Moral Landscape. Jaron Lanier and Sam Harris live within the media bubble reserved for celebrity intellectuals: writing celebrated books, participating in talk show circuits, and getting hired as consultants though when studied up close are unable to express coherent and consistent thought. Who Owns the Future? Coming soon to garage sales, bargain bins, used bookstores, and birdcage liners near you. To the authors and reviewers who lent their praise to the back cover: Book marketing may be just a game—but shame on you just the same.